We’re pleased to announce this weeks Business of the Week is Flags by MrFlag.com based on De Le Beche Street, Swansea City Centre. Mr Flag design and manufacture flags for a huge array of customers and ship them all over the world! You may have seen earlier today that have supplied Harry Potter and Three Musketeers movies, to TV shows like Big Brother and Ant & Dec’s Saturday Night Takeaway but also supply local businesses and individuals too! You’ll see their flags around Swansea City Centre at Morgans Hotel, Swansea, The Grand Hotel Swansea and Gwalia to name a few! Don’t forget to like our Facebook page and follow us on Twitter too as we’ll be announcing the winner on Saturday 25th April – SHARING the photo on Facebook isn’t essential to enter the competition but it would be great to spread the word! 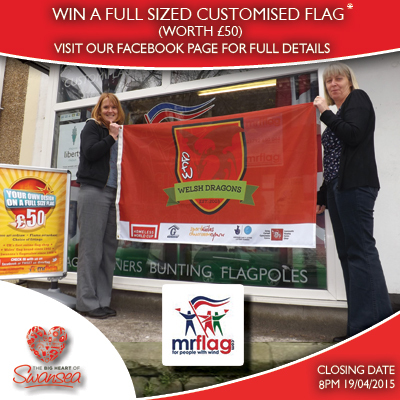 – Prize is full size (5x3ft / 152x91cm) customised flag with any design (worth £50). This includes all the design work, right up to the manufacture of the flag – which comes with your choice of fittings: perfect for flagpoles, sports matches, or just hanging on a wall. – The design of the flag must adhere to copyright and the use of trademarks is not permitted unless permission is provided.